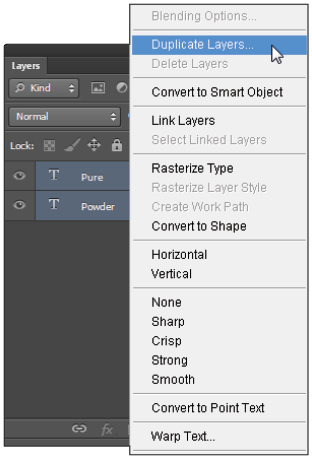 This tutorial provides you with a foundation for working with Adobe Photoshop text layers. It is the first lesson in the Adobe Photoshop CS6 Digital Classroom book. For more Adobe Photoshop training options, visit AGI’s Photoshop Classes. In this next section, you will add text to the image and then save the text as a style, thus allowing you to reuse the style and keep your text styles consistent. To save time, you will open a .psd file with the text layers already created. You will then move both layers to your ps0101_work.psd file. 1 Choose File > Open, and then browse to and select ps0102.psd; a file opens with a transparent background and two text layers in the layers panel. 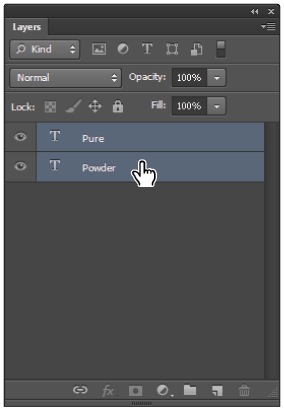 2 Click the Pure text layer, and then Shift+click the Powder text layer to select both layers. 3 Right-click (Windows) or Ctrl+click (Mac OS) on the right side of either layer, and then select Duplicate Layers from the contextual menu that appears. You can also select Layer > Duplicate Layers. 4 When the Duplicate Layers dialog box appears, select ps0101_work.psd from the Document drop-down menu in the Destination section, and click OK.
5 In the ps0102.psd file, choose File > Close to close the file. 6 Return to the ps0101_work.psd file, select the Type tool ( ), and then click the text area that contains Pure to activate the cursor in that text area. Once your cursor is active, press Ctrl+A (Windows) or Command+A (Mac OS) to select all, or choose Select > All from the menu. 7 The text is already set to Myriad Pro in the Set the font family drop-down menu. In the Set the font style drop-down menu, select Bold. Now you will decrease the spacing between each letter by changing the tracking value in the text. 8 Press Alt (Windows) or Option (Mac OS)+() left arrow repeatedly to decrease the spacing between the letters. Visually, decrease the size until you like the results. If you want to spread the text back out, press Ctrl+() right arrow until you have the spacing that you want. Before tracking the text. After tracking the text. Select Window > Paragraph Styles; the Paragraph Styles panel appears. In Photoshop CS6, you can save both Paragraph and Character styles. Applying a saved paragraph style changes the style of text in an entire paragraph. Applying a saved character style allows you to change just the style of selected text. You can easily create styles from text that you have already applied different attributes to, as you will do with the text that you just changed. 9 Click the Create new Paragraph Style button; Paragraph Style 1 appears in the Paragraph Styles panel. 10 Double-click Paragraph Style 1 to open the Paragraph Styles Options dialog box and view the attributes that are stored in this style. 12 Make sure that you are still on the Type tool, click anywhere in the Powder text area, and then click the Headline style that appears in the Paragraph Styles panel. The same text attributes are applied. 13 Click the Commit any current edits button ( ) in the Options bar to commit your style change. A plus sign next to the Headline style indicates that there may have been a style manually applied. Click the Clear Overrides button ( ) at the bottom of the Paragraph Styles panel to apply only the Headline style attributes to the text. As you can see, saving styles can help you build more consistent text content, and it can also help you edit text more quickly. In this next section, you will make a change to your Headline paragraph style. 1 Double-click the Headline text style in the Paragraph Styles panel to open the Paragraph Style Options dialog box. 2 Click once on the Color field at the bottom of the Paragraph Style Options dialog box; the Color Picker appears. 3 Your cursor is now an eyedropper; use it to sample a color from your image. Choose a light gray from the snow and click OK in both dialog boxes. The style has been updated. If your style does not automatically update, press the Clear Overrides () button.